By 1940, Lucas County had become saturated with gambling spots. The Webster Inn offered craps and horse betting in the rear, with bargain-priced steaks up front. There was the Old Dix, the Academy Club, the Chesterfield Club, and the Victory Club, all outside Toledo's city limits. Huge numbers of gamblers from Detroit scrambled for a piece of the action. Although the Detroit mobs were not permitted into Toledo to take control of this profitable business, their gamblers were welcomed. Toledo gamblers, police, and politicians kept it this way. New rules ruled the gambling night and day. If there were any bloodshed, the public would rise up through reform action and close down all gambling operations. Getting Detroit gamblers to the Lucas County clubs became a complex transportation system of busses, cars, and trains. A Detroit-Toledo gambling partnership had been created. Some called this arrangement the ?Mob,' some called it the "Mafia." In plain language, the "Wise Guys" from Detroit and Toledo were "connected." Just before the federal government deadline prohibiting all non-essential new construction because of the impending World War II, plans were drafted for a huge, first-class casino. All other clubs would close, except the Victory Club that would continue to handle local Toledo gamblers. The site picked for the new club was on the first road below the Michigan line, with the Dixie Highway from Detroit running right to it. Called the club Devon, it opened eight months before Pearl Harbor. A headline story on the front page of' The Blade described the new club Devon in detail. Since an illegal club cannot advertise, you just could not put a price on a good "news" story. Suffering from arthritis, Sheriff Hennessy, who had closed the other clubs, was staying in Magnetic Springs, Ohio, for an indeterminate time, and he was not expected back any time soon. Very convenient! The Devon would serve full-course dinners. Dinners in front, the horserace charts and the gambling room behind the restaurant. This backroom, 88 feet by 80 ft. was equipped with numerous exits and fire doors, lookout posts, alarms, and plenty of restrooms - all in air-conditioned comfort. Joe Scarne, the world's foremost authority on gambling, wrote in his chapter on casinos: The largest number of illegal gaming tables in a single casino at one time in America were in operation during the early 1940s at theClub Devon, a sawdust joint in Toledo, Ohio. It catered largely to Detroit bettors who were transported the intervening 50 odd miles in Grayhound buses at the club's expense. The Devon had 20 banked craps tables, 25 blackjack tables, and 8 casino side games-53 gaming tables in all. Reports at the time claimed that the syndicate paid for all construction costs and was operating in the black at the end of the first day! From the beginning, the club Devon was an obvious success. The 50 or more slots and horserace boards were not included in these reports. The entire 10,000 square footage was wall-to-wall humanity, with 55 shooters to a crap table, all urged to stand sideways to make more room at the table. Greyhound buses, trains, and cars brought players even from Chicago and Pittsburgh. Taxis only charged 50 cents but for every fare delivered, the doorman paid the driver a dollar, Estimated gross profits of over $1 million a week were said to be low. Profits, which could not be traced, wound up in safe deposit boxes under false names or in hidden Swiss bank accounts. There is no question that Toledo's biggest business during World War II was gambling. This Northwest Ohio city had become the gambling center of the entire United States. Profits for the mob were huge. Men in the Armed Forces during the war considered Toledo the greatest liberty town in the country; much of the city was posted "off limits." OK. So that is all THE BAD. Toledo of the 1940s was not just about illegal gambling. Before television, Toledoans had plenty of choices for clean entertainment. 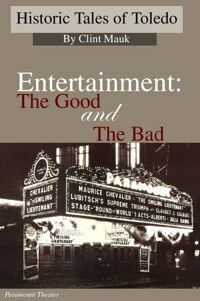 Certainly, one of the main sources of fun came from the movies. Going to the movies on Saturday night in the palatial theaters of the day was an experience almost larger than life. 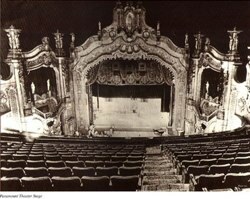 The Loews Theater sported the largest stage between New York City and Chicago, and played all the MGM films. Other Toledo movie theatres were the Rivoli, Palace, Princess, Royale, and many more. And do not forget the Capital and Esquire for live entertainment and burlesque. But nothing compared to the Paramount Theater'. Especially for youngsters and out-of-town folks who felt they had entered another world, the world of Hollywood and great excess: carpeting three inches deep, rich dark red velvet everywhere, sweeping staircases to the mezzanine.' and the loge boxes, tapestries, enormous chandeliers, and the oh-so-high ceilings, complete with blinking stars and drifting clouds! After standing in block-long lines to get in, small-town and rural folks accustomed to small-town movie houses would stand open-mouthed in wonder at the amazing luxury. The handsome ushers and usherettes, 20 to 25 of them, were dressed in full military--like uniforms, complete with white gloves, highly shined shoes, and brass buttons; they were envied and ogled by the youngsters. The Paramount's giant organ rose up, as if by magic, on an elevator to the stage level. You could hear the organ coming by the grand chords being struck. The Paramount's band, often Jack Runyan's or Paul Spore's, came up on its own elevator for every performance. It was magic, pure and simple! I remember as if it were yesterday, the day I watched and heard Frank Sinatra on the stage of the Paramount Theater. And then there were the supper clubs, like Ka-Sees and the Bon Ton. The very best was Kin Wa Lows, the name translated to "Lovely Flowering Palace." This Cherry Street supper club was top-notch and romantic; it made couples feel they were in a special world or in the movies. Prom nights were always a big feature. The owners of Kin Wa Lows had the good sense to treat these young couples like royalty, with good food, reasonable prices, and wonderful acts, like Ella Fitzgerald, presented on a hydraulic stage. They knew these kids would be back to eat and dance as adults with their sweethearts or as young marrieds for a night out. Nursing a set Coke all night was no crime. Then there was the Trianon Ballroom. Talk about finding romance and falling in love! A night of dancing on the 60 by 180-foot dance floor cost 25 cents. Patrons could find romance and fall in love to the sounds of the best bands in the land. Giant mirror balls cast a romantic shower of diamonds over everyone. Great entertainment came from the Dorsey Brothers, Benny Goodman, Glen Miller, and Toledo's own Helen O'Connell. So-called "low" beer, or 3.2 beer, nickel Cokes, and all this wonderful music made it so easy to fall in love at the Trianon. And if nothing else, more marriages were created at the Trianon than anything else. Good behavior was demanded and enforced. Acting up could result in being banned from the Trianon, sometimes for life! To many, this was the ultimate penalty. Yes, Toledo had its illegal side, THE BAD. But our city also had an elegant and romantic side with a popular sophisticated atmosphere that prevailed for many years, THE GOOD.